You can create a manifest for your USPS shipments by clicking "Manifest" in the top left corner of the Manage Shipments page. You can also find previously generated manifests by clicking this button. Once you select the chosen handover date, you can generate your manifest by clicking the button. The manifest will be generated and made available to download as per the image below. The manifest provides a barcode that USPS can scan to process several packages at once, rather than scanning each individual parcel. 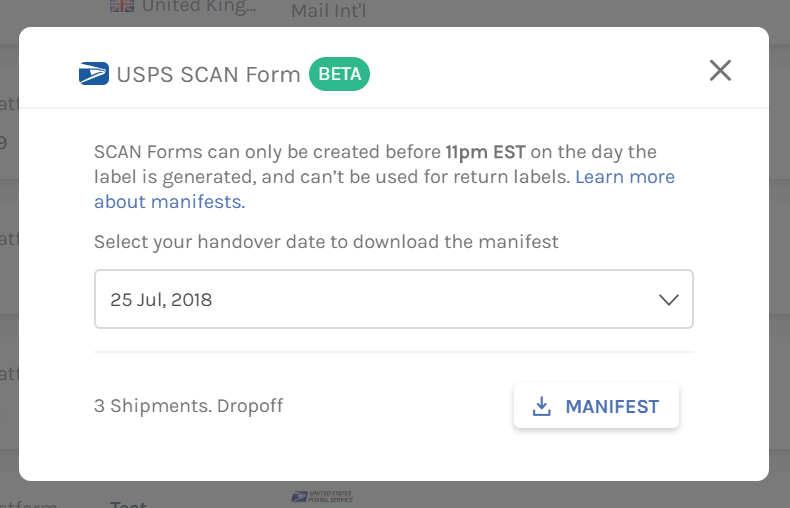 Please note, that if you create one in the morning, then create more shipments in the afternoon, the new labels will not be added to the original manifest. You will need to create a new manifest for these labels. Manifests will be separated by pickup location, meaning that if you have several pickup addresses you will be able to generate manifests per location. The manifest is created based on the sender address zip code. The manifest can be made for labels created that same day, or labels created with shipment dates up to 5 business days in the future. 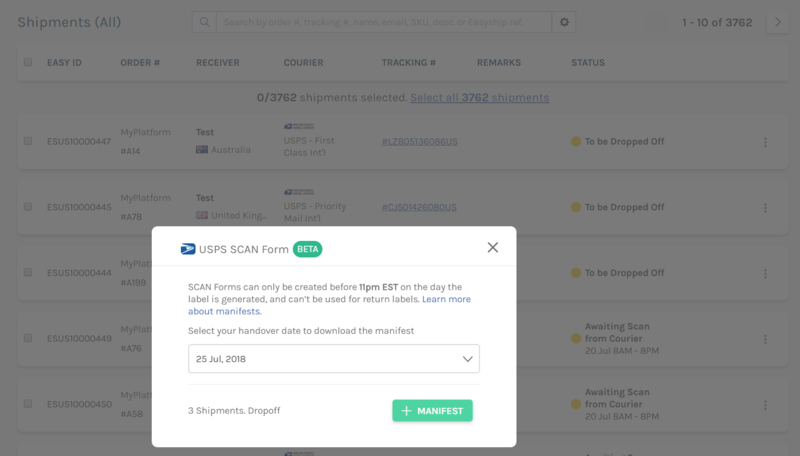 For example, if you create several labels on July 1st with a shipment date of July 5th, you must create the manifest for those labels on July 1st, by choosing July 5th on the calendar when you click "Select date." However, you cannot create the manifest for those labels any day after July 1st. Manifests must be created before 11 pm EST.